Ideal for elite players, the Tag Premiership is the highest standard of weekly league you can play in. Consisting of the best taggers in the country playing each other on a regular basis, the standard of play in the Premiership is consistently very high. Everyone playing at this level is eligible to play Representative Tag, firstly for your Region and then if selected for Ireland. Games are 8 a side with a minimum of 4 girls on the pitch at all times. You can have up to 8 subs on the sideline so a maximum of 16 players in your squad each night. Matches are 40 minutes long with 2 x 20 min halves and 5 mins for half time. Matches in the Tag Premiership are played under International Tag Federation laws, which have a number of differences to standard Mixed Social Tag laws. All games at Representative & International level use ITF laws so players chosen for these teams will be very familiar with them after playing in the Premiership. You cannot, for example, play for one Premiership team this Thurs and another one next Thurs - you stick to the same team at the start of the league. You can play in Social and Premiership leagues - but, in the interest of Social Taggers, there is a maximum of 2 x 2015 International players allowed on a Social team. DUBLIN: In UCD, each pitch is a separate "venue". So if you wanted to play Premiership and Social on the same night in UCD, register for 2 separate pitches (eg Grass for Premiership and All Weather Rugby for Social). You cannot play Premiership & Social on UCD Grass. LIMERICK: You can play Social and Premiership on Thursdays but there is a maximum of 2 x 2015 International players allowed on a Social Team. If you would like to try Premiership in Old Crescent but don't have a full team, sign up as an Individual Player where you will play a Premiership game in Round 4 at 21:15 each Thursday after your Social match (which will be in Rounds 1, 2 or 3). Squads lists must be submitted to info@tagrugby.ie one week before league starts. Email info@tagrugby.ie within 24 hours of your match kick off time. As standard Premiership laws, this player cannot already be on the squad list of another Premiership team in the League. Failure to adhere to this regulation means you have played an illegal player and thus your team forfeits the match. We will email each captain a PDF with the squad list of every Premiership team before the league start. This is to make everything as transparent as possible. We will update this PDF of Premiership players and their teams throughout the league as unaffiliated players are added. To help us improve standards with the league and allow us in the future keep track of Top Male / Female Try Scorer etc, all Premiership teams must wear numbered jerseys. A player must write their jersey number and name on team sheet. Each number must be legible. Each player must have their own individual jersey number on the night (no duplicates). At least 16 Premiership teams must register for the 2 Division model to work. To start a game, you must have at least 5 players on pitch, of which 1 must be female. You no longer need to have 3 females on the pitch at all times. Ball must be placed on ground first before elbows or knees. No surrendering. An attacker must keep moving - they cannot deliberately stop and present tags to defender. 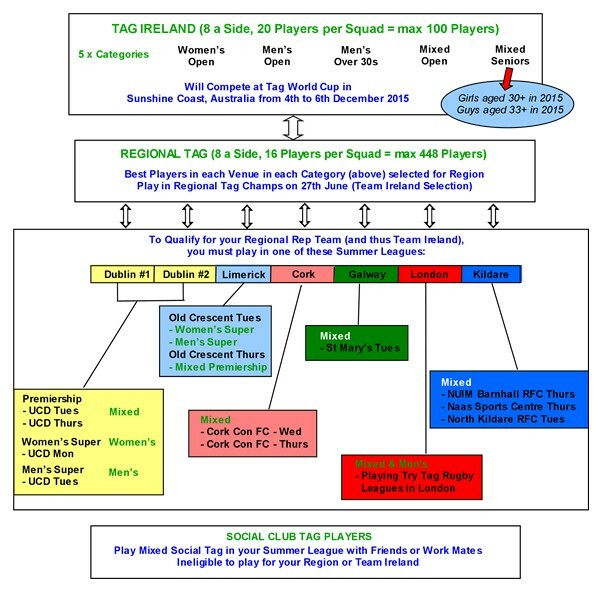 As we are now a member of the International Tag Federation, we have developed a pathway for players to play firstly for your Region and then, if selected, for Ireland. To be eligible for selection, you must be playing regularly at elite level.